We leverage all kinds of different technology to get your problems figured out. Imagine syncing a bunch of photos you just took on your phone to your own server, and your desktop automatically at the same time. Thanks to Open-Source technologies, we can integrate all kinds of systems together. Keeping your productivity high, and frustrations low! These tricks we have in our bag of demons aren't just available to Businesses or Organizations, but they can help people at home too! If you have lots of digital photos and videos you need to keep safe, and manage, that's just an example of something we can make awesome! Our bag of demons (technologies we work with) continues to grow over time. If you want to get a beginning idea of what we can do for you, we recommend you peruse our website, and consider asking us some questions. We at LANified! 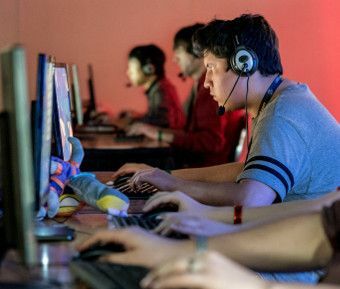 serve the most demanding of computer users: competitive gamers. In order to meet the needs of these users, we leverage extremely reliable and performant technologies. To these clients of ours, 16 milliseconds can mean the difference between first place, and second. At our events, there are no "small problems", it all matters. By working with LANified! IT Services, you gain access to the forged-by-fire methods and technologies we leverage for ourselves and events. In-turn helping you move from second place, to first. We offer this access to those in the Calgary area, or International regions. The majority of our bag of demons (technologies we work with) is Open Source, and this enables us to be extremely agile. But at the same time we also work with Windows and related technologies too. While we do work with individual technologies at times, we also work heavily with how they can integrate with others. The Open Source demons (technologies) we work with can integrate with many other systems, including existing WIndows technologies. The Open-Source demons we work with typically come with residual benefits, such as reduced/eliminated licensing costs, software bugs being fixed faster, and improved reliability. Some noteworthy demons include Ubuntu Linux, FreeBSD, ZFS, Apache/nginx, MySQL and Proxmox VE. But we don't just talk about Open-Source, we "eat our own dog food" too! Open-Source demons run our infrastructure every day and have done so for years. We can't read minds, but we often see functional hurdles that our clients weren't even aware existed. This foresight guides us to present many effective solutions to our clients that usually they had not thought of before. We set you up with your own enterprise-class phone system, even at home! If you want our professional input on areas that we think you would see improvement, we recommend you contact us and consider having some coffee with us. LANified! IT Services provides support and implementation coverage to the Calgary region as well as Worldwide, depending on the task. Our levels of support are flexible and typically can be tailored for your particular needs. We also provide implementation services for new IT systems.